By: Jorge Petinaud Martinez.October 8. 2011. Havana, (PL). – In an exclusive interview to Prensa Latina, via e-mail, the director of Cuarteto de Cuerdas de La Habana, who also won a Cubadisco last year, for the Brouwer work for that format, said that the record astonished the United States. The United States specialized critic is delighted with the discovery of the Leo Brouwer, composer of quartet, assured the Cuban violin player Jorge Hernandez, winner of a 2010 Latino Grammy, during a trip from Philadelphia to New York. In an exclusive interview to Prensa Latina, via e-mail, the director of Cuarteto de Cuerdas de La Habana, who also won a Cubadisco last year, for the Brouwer work for that format, said that the record astonished the United States. This genre is considered as very difficult for composers and in the history of music there are only a few examples of this kind of pieces that can be considered “great”, explained. Suddenly they have discovered the third quartet made by Leo dedicated to us and critic coincides that it must have a place among these historic creations. The technical, rhythmical and musical difficulties are enormous, said the artist. Integral Cuartetos de Cuerdas was recorded in Cordoba, Spain, following an initiative of the General Society of Authors and Editors (SGAE, after its initials in Spanish), in honor to the 70 birth date of the internationally most recognized living Cuban musician. After its prices in Cubadisco and Grammy awards, the New York record company Zoho Music, bought the rights for its international commercialization and the 9th of August of 2011, presented it in the US market, indicated the source. They were in touch with me to arrange everything relating this promotional tour and now we are discussing about new collaboration plans, added Hernandez. Zoho Music was founded din the Big Apple in 1993 and since includes in its catalogue only jazz and rock. The record of the Cuarteto de Cuerdas de La Habana widens their repertoire and is the first record of the classic music division of the company. According to negotiations that are being held and under this contract, the group can record new productions. Since its first Works with Empresa de Grabaciones y Ediciones Musicales de Cuba (EGREM), the Cuarteto de Cuerdas de La Habana draw the attention of specialists and music lovers for their music and virtuosity. In 1987 their conquered the Award to the Interpretation Mastership at the Havana Camera Music Festival. Regarding their current promotional tour, the violin player stated that they received a warm reception from the public in Milwaukee and then at the New York and Philadelphia Cervantes Institutes. Hernandez, founder of the group, since its creation in 1980 by Leo Brouwer, commented that there is a great expectation for the two shows they will offer at the skyscraper city. The second show is scheduled to take place at the Tenry Institute on Sunday. The violin player praised the professional and ethical work of the rest of the group: Eugenio Valdes (second violin), Deborah Yamak (violoncello) y Yamir Portuondo (first violin), who is now recovering from a surgery and was substituted for the tour by the Vietnamese Hoang-Linh. Talking about the repertoire they presented, he mentioned some pieces written by the Cubans Brouwer, Yalil Guerra, Igmar Alderete and Manuel Corona, as well other made by Latin American composers such as Chico Buarque, Violeta Parra, Ástor Piazzola, the Puerto Rican Rafael Hernández and the US Richard Rogers. 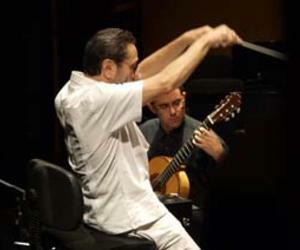 Hernandez pointed out that the coincides of the success in the United States of the creations made by the author of Espiral eternal with the celebration in Havana of the Third Festival Leo Brouwer of Camera Music – one of the most prestigious ones in the world – ratifies the universal value of the tenth winner of the Iberian American Award “Tomás Luis de Victoria". With the novelty and elegance that characterizes him, Leo communicated me just a few days ago, that he finished a new quartet dedicated to me, which I consider a great honor and infinitely thank him, said the musician to Prensa Latina. We are adjusting our program from now one to take part in the 2012 Fourth Leo Brouwer Festival and carry out the world premiere of that piece in Havana, said him with great emotion. Without hiding his admiration for Leo, who he considers his teacher; Hernandez offers us another good news. We have news that since Leo´s Fourth Quartet is a first world recording, we are pre-nominated as best camera group for the next US Grammy Awards and Leo as author of that piece. Hernández insisted that it is only a pre classification, since in October will be defined the nominations. However, it is in fact a great recognition, because this is a world event, which goes beyond Latin geography. Referring to their next compromises, Hernandez explained at the end of the US tour, they will start a tour which consists of 11 concerts in Spain, where they are fulfilling a contract with the Cordova Symphonic Orchestra, founded by Brouwer. Then we will have presentation in Romania and it is still pending to see in which European country will be held the European launch of the comprehensive record Cuartetos de Cuerda, he added. The musician referred with great enthusiasm to a project that came out during a recent trip to Germany. There is an interest for us to make a presentation together with the Cuban Contemporary Dance Group in a festival in the city of Gotingen, he indicated. We already discussed it with Miguel Iglesias, director of that prestigious group and with Leo, to whom we asked to written something especially for that occasion, expressed. There is also an interest for us to return to Moscow, ended the artist.